The Short Version: Patti Feinstein has been in the dating coaching business for over 20 years and has proven her ability to help singles find love and happiness. Whether you need help with your look, an online profile makeover, or even matchmaking, Patti’s diverse range of dating services will get you ready for that first date. Her experienced and authentic manner competently directs her clients to improve their communication, body language, and appearance. Dubbed “America’s Dating Coach,” Patti takes a direct approach to dating coaching and honestly tells her clients what they can do to succeed in today’s complex dating environment. Being single means you may often find yourself on yet another bad date, stirring your drink listlessly as the person across from you either talks incessantly about nothing or sits in a similar state of frustrated silence. Especially with all the choices offered by so many dating websites, it’s easy to feel overwhelmed or burned out. Singles today juggle multiple mediums — flirting on websites, apps, and in-person — and still may find themselves back at square one at the end of a tedious night. 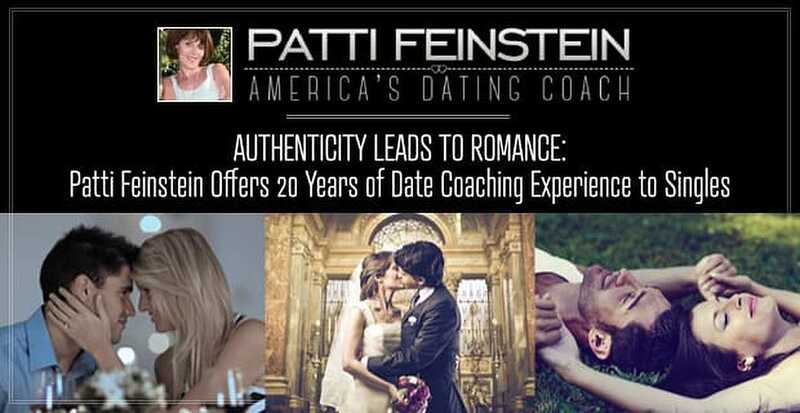 Patti Feinstein honed her talents as a dating coach by working for a matchmaking business. Sometimes singles just need a pep talk or a little guidance, and that’s what Patti Feinstein has dedicated her life to for the past 20 years. Patti is “America’s Dating Coach,” offering dating coaching, Internet profile management, and even some matchmaking for particular clients. Her goal is to give honest, unflinching advice to individuals and help them pinpoint their dating flaws so that they may find romantic success in the future. Taking a vested interest in singles, Patti coaches her clients with authenticity and a wicked sense of humor, confident in her ability to bring out the best in those who need it the most. In the ’90s, before online dating was widespread, Patti worked for a boutique dating service and often found herself drawn toward the coaching and matchmaking side. She saw an opportunity to go in depth with clients, not just matching them with people but really giving them the tools to succeed at dating anyone they desire. She built her dating empire in 2002, using her expertise to motivate and advise single men and women. With direct advice, Patti gets to the heart of her client’s issue and doesn’t shy away from telling the truth. Patti had seen enough success and failure in the dating game to figure out the right strategies to recommend to anyone feeling lost. At first, she didn’t have a word for what she was doing — she was a dating coach before dating coaching was widespread. As a dating coach, Patti is straightforward, telling singles what they need to hear. She’s had thousands of clients and can assess people quickly and accurately. When she sits down with a client, she doesn’t like to waste time or tiptoe around the truth about dating in the 21st century. She has seen the same patterns of behavior crop up again and again over the years and understands what fixes to make for an individual’s problems. She may seem like a mind reader to some clients, but she’s just very good at what she does. Though the medium of dating has transformed, Patti doesn’t believe the dating expectations of men and women have changed very much. Everyone is still looking for respect and affection. Molding her business to benefit the different needs of modern singles, Patti offers a variety of services, custom designed for clients. Over the past two decades, she’s seen every problem under the sun and knows how to tackle it effectively. From online profiles to first-dates strategies, she confidently coaches singles and gets their love lives back on track. First Patti meets with clients over Skype or in-person to assess their dating strengths and weaknesses. She may focus on healthier ways to communicate or she may offer strategies for meeting new people. It depends on the individual. The aim is to up a person’s potential for making a good first impression and maintaining a solid relationship. “Dating coaching isn’t just about behavior, it’s also about perception,” according to her website. With upfront advice and image consulting, Patti prods people into presenting themselves in the best possible light so that any date will be instantly impressed. From this dating coach, the modern dater can get help with online dating. Patti will help you pick the right dating site for your needs, give your profile a makeover, and even create outreach emails for you to send to prospective dates. Coming up with strategies for navigating online dating, she guides singles who may feel ill-equipped to meet their match on an online platform. Patti is selective about the matchmaking she does. She will only take on male clients whom she truly believes she can help. Her matchmaking services are for men interested in some hands-on assistance. You can cut the drama and stress out of dating by having matches brought to you by this deluxe service. Patti takes clients on a case-by-case basis, deciding what she can offer them and what the best course of action is to ultimately get them where they want to go. Her custom services are designed to fit a diverse clientele, with an age range from late 20s to early 60s. Recently, Patti has seen an influx of divorcees who are older and looking to dive back into a dating environment that’s changed greatly since the last time they were single. Singles come to Patti’s dating coaching site with all sorts of needs, and she does her best to provide a catch-all service that they can rely on completely. What she’s learned after two decades of dating coaching is that people of all ages and backgrounds often find love in unexpected and extraordinary ways. The most important advice she can give is to keep going. Even after a string of bad dates, love is still out there, so don’t get discouraged.